It was said that the C-130H pilot, Lt. Col Steve O’Brien, was returning from delivering supplies to the Carribean, which more specifically meant the U.S. Virgin Islands. Air Force Magazine recently reported that seven other crew members were on board, including copilot Maj. Robert Schumacher and flight engineer MSgt Jeff Rosenthal. Some reports state that copilot Schumaker looked down on Flight 77. How could he look down on something that was at first right in front of him, at a distance of two miles, and five minutes later was up to 15 miles (more than was possible) further ahead of him? One of the documents released by the 9/11 Commission in response to FOIA requests is the flight tracking strip from Andrews AFB for September 11, 2001. This tracking strip indicates that Gofer 06 took off from Andrews at 9:33 am. Given that the flight engineer for the cargo plane stated that they circled after witnessing the crash, and a large aircraft takes a few minutes to circle, we must assume that Gofer 06 could not have left the vicinity of the Pentagon any earlier than 9:41 am. Originally the crew had planned to return to their home station in Minnesota. But then they decided “the prudent thing to do was to get to a safe haven and take a time out.” They did not go to the nearest safe haven, however, but instead continued on in an improbable path that ended in landing at Cleveland airport, approximately one hour later. The Chairman of the Joint Chiefs of Staff on 9/11, Hugh Shelton, was reported to have been one of the many national leaders who were absent or indisposed on that fateful morning. The official line is that he had taken off from Andrews AFB to fly to a NATO meeting in Hungary and was 1.5 hours out when he was told about the first WTC event. After being told about the second plane going into WTC 2, he told his crew to turn around and go back. Apparently he had to tell them again after they heard about the Pentagon crash, possibly because they had not yet gotten clearance to fly back. Unfortunately, the September 2011 edition of Air Force Magazine, mentioned earlier, contradicts both of these accounts. Another article in this issue includes comments from Captain Rob Pedersen, who was the flight navigator for Shelton’s plane on 9/11. This article states that after Shelton instructed his pilot to return to the U.S., the crew didn’t get clearance to return for several hours. This article also claims that the plane did not have any destination and “so we went into a holding pattern near Greenland,” Pedersen said. The new report says that it was Pederson’s job, as the navigator, to come up with a list of alternative landing sites, the possibilities for which included Thule AB, Greenland and NAS Keflavik, Iceland. Lt. Col. O’Brien has admitted that by the time they asked him to follow that aircraft, the event at the Pentagon had already occured. He new saw the impact. 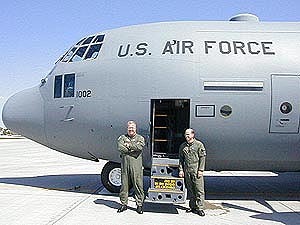 I’m not sure why you say the C-130 is an unusual aircraft. They’ve been built for decades and there have been over 2,300 delivered, more than 757s and 767s combined (the aircraft types involved in 9/11). The whole idea is nonsense. We haven’t used Ground Controlled Interception since the late 1960s and nobody ever used bystanders to do it. The only person who could direct any interception on that day was Major Nasypany, the NEADS mission commander. The doctrine changed that day and the system healed with the addition of AWACS and CAP over potential targets. Bin Laden’s organization never had any plan for follow-on attacks because they knew the window would slam shut. Speaking of Bin Laden, I have a flight story: I was doing a WTC7 Awareness tabling event at our local Saturday Market in Salem, OR. – summer 2013 – Guy, about 40, comes up to me and says: “The day after 9/11, when all air space was closed, I was working on a landscape crew at Santa Clara U., the campus overlooks the San Jose Airport. Late that morning a private jet came over the hills with two fighter planes beside it. The small jet landed and the two military jets turned out over the ocean. Minutes later, the private jet lifted off and the two military jets swooped in beside it, they turned west and headed out over the ocean.” He told me the jet picked up Bin Laden’s daughter – she was a student at San Jose State. I’ve wanted to see if I can check the student body records for that school on 9/11 but have not done so. The guy was quite creditable and the story did sound truthful. gofer 06 took a 270 heading out of Wash. air space and then got vectors from cleav. center and still made it within 15 miles of flight 93? is that what i am to believe. it also climed from 3000 ft to 17000 ft before being handed off. i have watched many c-130s clime. and never one that could make that flight in 15 min. however everyone seems to say they made a direct flight.